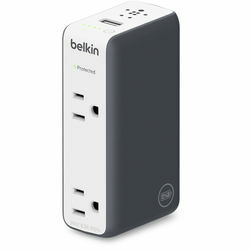 B&H Photo has the Belkin Dual-Outlet Travel Rockstar Surge Protector w/ (2) AC Outlets & 3000 mAh Battery Pack on sale for $34.99 with free shipping. This item is currently selling onAmazon ​for $37.99 and has received 4.3/5 stars based on 4,298Amazon customer reviews . The next lowest price for this item from a rated merchant on Google Shopping is $40.08 shipped.